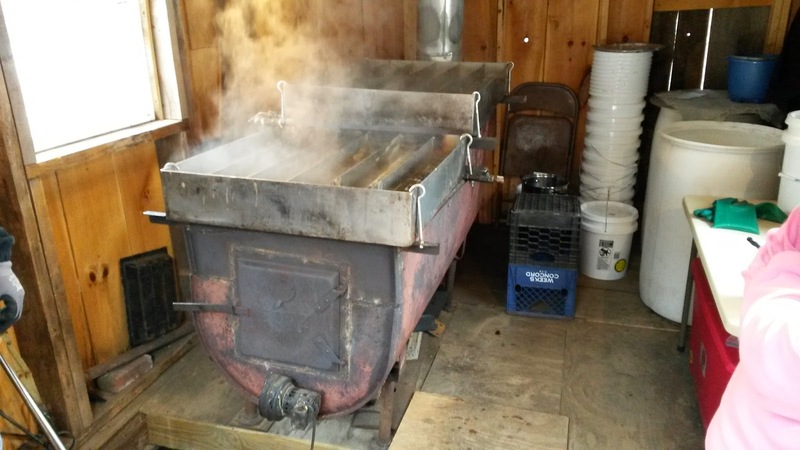 Maple sugar season is nearing the end in the lakes region. Both sugar houses around Lake Wicwas have been processing the delectable treat the past couple of weeks. 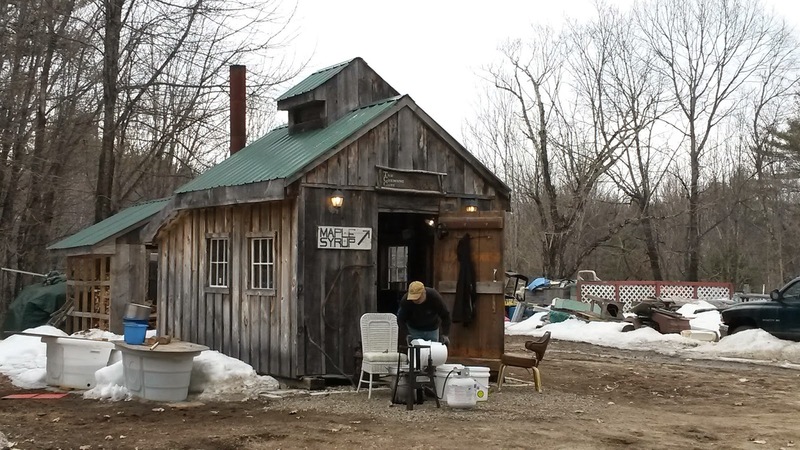 We stopped by the Chemung Gang Sugar Shack (just up Chemung Road from Meredith Center Road) to get some local syrup, and Bill Taggett gave us an overview of their operation. Bill said it is a less-than-average year for sap production, but they will have some for sale. If you want to have maple syrup with local Lake Wicwas flavor on your blueberry pancakes this summer, you'd better stop by one of these operations soon! As if the arriving waterfowl weren't struggling enough with the lack of progress on the melting ice, we received some snow this week to fill in the few openings that had formed. Last week I found a Heron fishing in one of those tiny openings in the lake; this week I noticed this pair of ducks trying to eke out a living right beside the road where running water from a culvert under the road had carved out a small pool. And beside the dam, where running water has created another opening, I saw my first pair of Canada Geese. While we were watching them, another pair of geese came flying in to the same spot, and we got to observe some territorial defense in action. As soon as they touched down, the two that had staked their claim to perhaps the largest open section of water on Lake Wicwas decided it was not big enough to share and went after the intruders immediately. A loud standoff and aggressive posturing took place, with the established pair chasing the new-comers onto the ice. That wasn't sufficient, so they took to the air in pursuit. The unwanted guests flew off. But they weren't ready to give up the fight; they landed again just a bit a farther along the ice, so the residents went after them again. There were several up close and personal encounters. They continued to harass them, chasing them along the ice to make sure they got the point. Did you notice the little Hooded Merganser just sitting at the edge of the ice watching all the antics? Eventually the initial residents reined supreme and successfully defended their homestead. I put a video clip of the final chase across the ice on Youtube, as blogger doesn't upload video very well. Warm weather today is helping open things up more now. As the ice recedes there will eventually be enough lake to accommodate everyone. The minute there is enough runway for loons to be able take flight off the water, I expect they will join the crowd now assembling for another summer on Lake Wicwas.